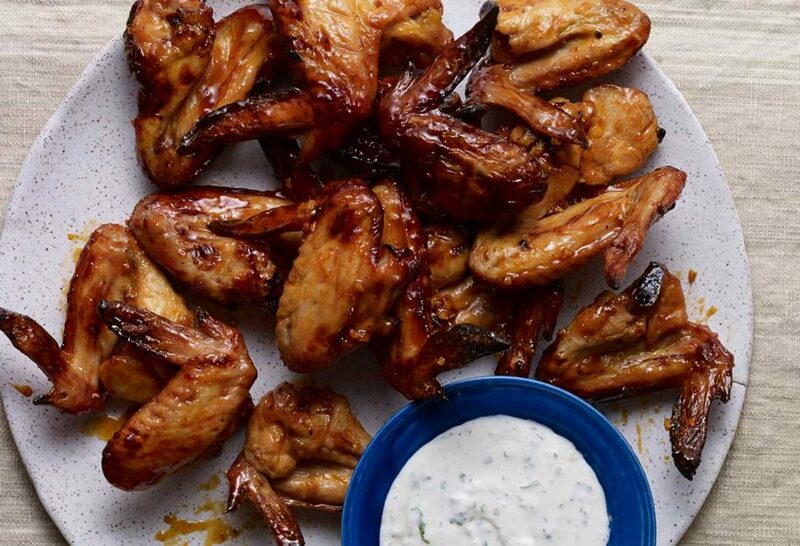 In a large bowl or baking dish, add all the ingredients for the wing marinade: buttermilk, garlic, chipotle chiles, sauce from chipotles in adobo, orange juice, orange zest, salt and pepper, mix to combine. Add the chicken wings and mix well to make sure all of the wings are coated. Cover tightly with plastic wrap and refrigerate for a couple hours or overnight. Preheat oven to 450°F. Place a cooling rack onto a lined (with aluminum foil or parchment paper) rimmed baking sheet and brush the cooling rack with vegetable oil. Remove the wings from the marinade and place them directly onto the cooling rack. Bake for 40 to 45 minutes, flipping once after 25 minutes, until crisp and browned on all sides. While the wings are baking, place a small saucepan over medium heat and add all of the ingredients for the chicken wing sauce: agave syrup, garlic, Tabasco sauce, sauce from chipotles in adobo, vinegar, olive oil and salt, bring to a simmer. Whisk to emulsify and combine. Turn off the heat and set aside. In a small bowl, combine the crema, queso fresco, lime juice, cilantro, chives and salt and pepper to taste. Stir well and set aside. Once the wings are ready, place them in a large bowl. Whisk the agave wing sauce once more with a fork or whisk, then pour it over the wings and toss well so that all the wings are coated. Serve with the crema dipping sauce on the side. We made these last night—we decided they are the best we ever made! We were so excited we forgot to take a photo for Instagram! Sami’s Smashed Potatoes were great on the side. Thank you for another fantastic recipe!!! Oh next time a photo please, Joanne….would love to see it! My wife and I made this last night and it was wonderful. We reduced the syrup by 1/2 and it still had a satisfying sweetness. We added a bit of ground chile piquin to the sauce, and will add even more next time to make it even hotter. I’m glad you made the recipe your own, Paul, and that you guys enjoyed it! Gracias Pati por esta Rica receta. Se la hago a mi nietesita cada vez que me visita y queda encantada. Bendiciones para ti y los tuyos. Thank you for tuning in Ernie! I hope you enjoyed the wings! Just Wondering if there is something I can use for a Buttermilk replacement. My family eats Paleo. Thank you! If you are comfortable with yogurt, you can substitute it with that, otherwise, whatever kind of milk you like (almond, rice even coconut). i love your show . I am married to a man from Mexico and we watch your show together and then I cook something that week . So far everything has been a hit . He is a big food critic and hard to please lol . Thank you for great recipes that ate truly authentic Mexican food . I am making the wings and Mac n cheese tomorrow …wish me luck . Ps there is always a bowl of avocados in my kitchen ? Qué gusto oir que les gusta, Karen! Espero que prueben muchas más recetas. I saw the link to these delicious looking wings on your FB page and knew instantly I would make them for super bowl Sunday. I picked up some wings from a local seller at my farmer’s market. so they should be really special. I’m a fan. Thank you. Awesome! I hope everyone enjoyed them!! My husband loves wings, and these are one of his favorites!! The combination of flavors was new to me but it was amazing. Thanks again Pati! Thanks for trying out the recipe, Caris! Would it be ok to substitute the agave syrup with honey instead? I watched this episode and everything looked fantastic. I will try it all but would also like to make the Mexican version of our hot dog. It looked excellent. Where can I get the recipe? Thank you so much! Hola Margaret, I hope you try the wings! For the Sonoran Hot Dog, here goes: Wrap a turkey hot dog with bacon and grill. Split the grilled bacon-wrapped hot dog in half lengthwise, add 2 tablespoons grated melty cheese (such as mozzarella or monterey jack), and place back on the grill to melt cheese. Then serve on a buttered hot dog bun that has been toasted on the grill, and top with sausage, a drizzle of mayo, mustard, ketchup, chopped tomato and onion, and a grilled jalapeño chile. made the wings the day I saw the show. they were a hit with the family the will go into my chicken rotation. I love your shows. I love it that they will be in your chicken rotations, great news! Chicken wings look good. Thank you – will try ! I made these wings last Wednesday night and they were delicious! My husband liked them so much that he asked me to make them again this Saturday. They were extremely tasty with a deep and textured flavor. I consider myself a bit of a wings expert, and these were definitely right up there! I am so happy to get the thumbs up from a wings connoisseur!! I love your show and have tried several recipes that you feature on your show. Thank you so much!! These chicken wings and macaroni and cheese are me and my husband’s new FAVORITE!!!! They were both soo good that I can’t wait to cook them for someone else! Hi Aastria, Thrilled to hear your husband enjoys the wings and macaroni! Thank you for making them!! I saw Pati make this on TV this weekend and I had to make it as well. Delicious! I love the buttermilk marinade with orange and the glaze is fantastic. Thank you for a wonderful and easy recipe.